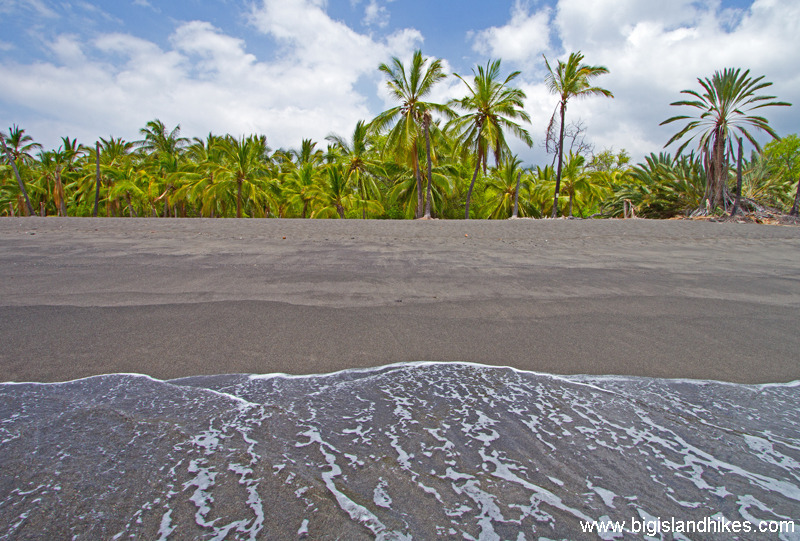 Honomalino black sand beach is one of the most picturesque sites on the Big Island. Because it is only accessible by foot and located in a very remote area south of the fishing village of Miloli'i, it is often free of crowds and remains in a fairly natural state. Honomalino bay has nearly a half-mile of beach, which is actually a mixture of black and white sand known as a salt-and-pepper beach. High palm trees fill out the scene. The short hike to Honomalino passes through some nice rainforest and also crosses massive lava flows from Mauna Loa. Honomalino beach has no facilities of any kind, so plan ahead to Leave No Trace and pack out all your trash. The trail to Honomalino and the beach itself are for day use only. There is no camping and no fires allowed. If you visit on a weekday, it might look like the photos on this page. Trailhead: On Hwy. 19 in the Kaʻū District, about 40 miles south of Kailua-Kona or about 30 miles west of Naʻālehu, find the road to the fishing village of Miloli'i just south of the 89 mile marker. There is a prominent sign. This road is "Miloli'i Road." Follow it for four and a half miles until it ends at Miloli'i Beach Park. There are several private or neighborhood roads along the way, but the main road is always obvious. The road is maintained by the state and paved, but it becomes more and more narrow as it progresses toward it's end near the sea. There are several sections where it is one-way only. This is a small community where children expect to be able to play safely in the streets, so drive very slowly along the road and take your time. Just after the road gets very close to the ocean, find Miloli'i Beach Park near a prominent yellow church called Hau'oli Kamana'o. When you see the church on your left, turn right and park between the open beach pavilion and the fenced sports courts. This is the parking for Miloli'i Beach Park. Gear: Standard hiking gear. Bring plenty of water and sun protection. Plan on packing all trash out of Honomalino. Hike: From the parking area, don't start by walking toward the ocean in Miloli'i Beach Park. Walk north for a few yards, go around the sports court, and find the beginning of the trail marked by a State sign that says "Honomalino Beach" followed by restrictions for the area. The trail initially crosses private property via a public easement inland of a small bay. The correct way to hike is indicated by several yellow arrows painted on the black lava along the trail. Ensure you are on the public trail. Once you pass the yellow arrows, the trail is obvious as it crosses through a pretty rainforest with several ancient sites. Stay on the trail and out of the ancient sites, which are on private property. You soon pass through an area of devastation where you get amazing views uphill of lava flows from Mauna Loa. Just before Honomalino you'll pass some more private property. Just stay on the trail all the way to Honomalino. Enjoy the beach, Leave No Trace, and watch out for dolphins in the bay.